The Fury TV show was a western action series about a widower (Jim Newton) whose wife and son had been killed by a drunk driver in an auto accident. Jim owned a ranch and adopted an orphan boy who had been wrongly accused of a minor crime. Joey developed a deep, loving relationship with a horse on the ranch named "Fury". Fury apparently felt the same way about Joey since he wouldn't let anyone but Joey ride him unless Joey said it was ok. The episode plots usually involved a person or persons who did something bad and ended out in trouble and then would be saved by Fury. There was a definite attempt to teach the kids who were watching what is and is not acceptable behavior. Fury got his name when Pete, the ranch's foreman, said that the horse was full of "Fire and Fury". Fury had begun life as a wild horse. It had taken three years of trying before they finally caught him so the name fit pretty well! Fury may have been the king of television shows when it comes to merchandizing! There were several comic books based on Fury. There were Fury coloring books, puzzles, trading cards, and a board game! In addition to his outstanding movie career, Peter Graves also appeared in several other TV Series including "Mission Impossible", "Court Martial", "Whiplash", and "Where's Raymond"! He also appeared in two of television's greatest miniseries, "The Winds of War" and "War and Remembrance". Peter is also the brother of James Arness, best knowns as Marshall Matt Dillion on the TV series, "Gunsmoke". Peter even worked with his brother once on Gunsmoke by directing episode #402 of that series titled, "Which Dr.". The horse named "Highland Dale" who played "Fury" on the show was a purebred "American Saddlebred". The Fury TV Show was not the only starring role for Highland Dale! The horse also starred in the movie, "Giant". In that movie, Highland Dale's name was "War Winds". Fury was the first of many series that was produced for U.S. TV by "ITC Entertainment", a production company based in England. Highland Dale somehow appeared at a wild animal park called, "Africa USA" that is located in the Santa Clarita Valley of California. Africa USA also housed the animals for the TV series, "Daktari". Anyway ... the park attendants had no idea that Highland Dale was the star of Fury! He was very sick when he arrived at the park but they got him back in good shape. They had been told that the horse's name was "King". It was strange when they discovered that "King" was extremely intelligent and could do many tricks. Finally, one day a stuntman visited the park and recognized that "King" was really "Highland Dale"! The people who worked at the park were understandably thrilled! Bobby Diamond also had an extensive show business career including regular roles on the "The Many Loves of Dobie Gillis" and "Westinghouse Playhouse". He even appeared as a guest star on three episodes of the series, "Lassie" and played a different character each time! 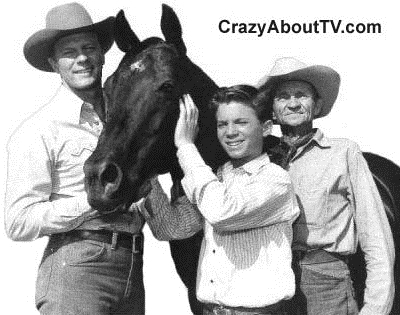 After Fury went off the air, it ran in syndication until 1966 with the new name, "Brave Stallion." Just in case you wondered what happened to Bobby Diamond, he went to law school and earned his degree in 1970. He then practiced law in Los Angeles, California. Thank you for visiting our Fury TV show page!